Did you know that giant extinct creatures such as woolly mammoths, ground sloths, bison and mastedons roamed the grounds of Northern Kentucky long ago? Specifically Union, Kentucky? During the Pleistocene Era these animals were attracted to the mineral and salt deposits in the ground. Unfortunately for them, many sunk to their deaths in the soft, boggy ground that is now Big Bone Lick State Park. The park got its name because when explorers discovered the grounds in 1739 they found many giant bones. You can learn more about the history of Big Bone Lick State Park, the birthplace of American paleontology, here. 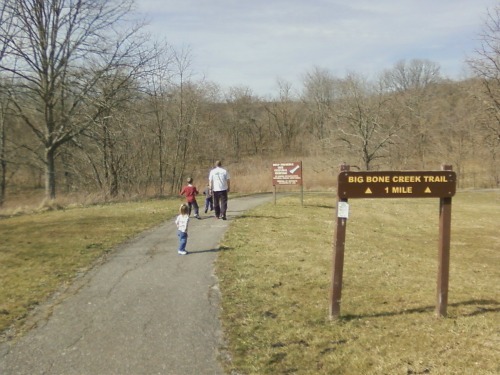 Located at 3380 Beaver Road in Union Kentucky, today this former bog is home to several hiking trails, a museum and gift shop, a large diorama depicting life in the bog, playgrounds and a campground. 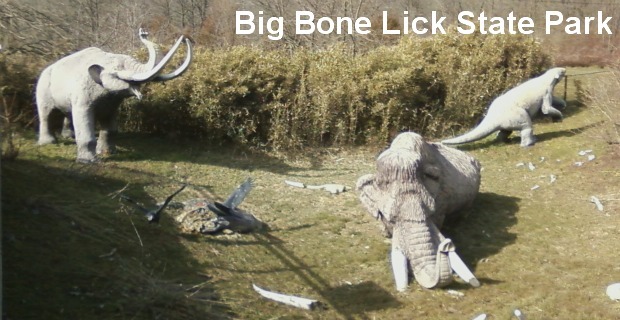 On a recent sunny March weekend, my family and I decided to check out Big Bone Lick. The kids loved it. 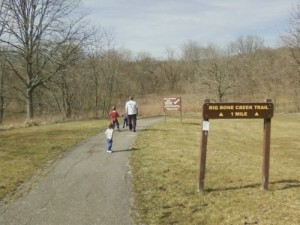 We walked Big Bone Creek Trail, which is an easy 1 mile paved hike. The trail takes you through a few different habitats, including wetlands, savanna and grasslands. One part of the paved trail was muddy so we walked in the grassy spots to the side. It did not look deep or muddy in the grass, but I did not doubt that the area was once a bog as my shoe sunk several inches past the tall wet grass and into the mud way below. The ground was like a sponge. And I don’t mean just muddy like your backyard after a good rain. This ground was soaked. 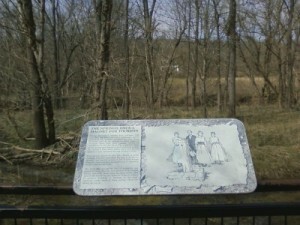 The trail took us over marshy ground, past the former bison fields, through the woods and to the “salt-sulfur springs”. 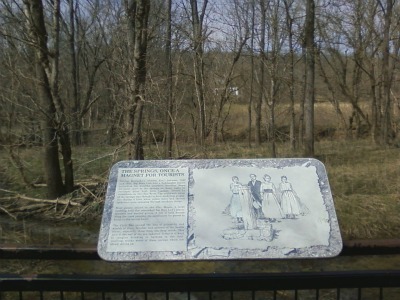 It was there that during the early half of the 19th century visitors came to the springs for their healing properties. After looking at the dried up creek bed, it was hard to believe that tourists flocked to this hotspot, often considered a spa! It was quite the vacation spot back in the day. Go off the paved path and follow Bison Trail to see the bison herd at the park. The bison come out during cooler weather and in the morning, so if you go in the hot afternoon, like we did, you may miss them. The state park was established in 1960. While at Big Bone Lick, make sure you check out the small museum and gift shop. The park’s busy season is in the spring and summer when they schedule activities each month. Check out the park’s website for a detailed calendar of events such as a ghost hunt (March 31st), Primitive Skills Day (March 24th), and Save an Endangered Species (April 21st). Enjoy your visit. We sure did! 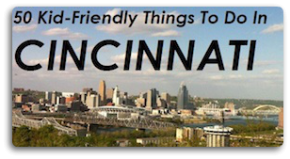 When not blogging for Family Friendly Cincinnati, you can find Michelle writing at her personal blog, I’m Living the Good Life. Howdy, I uncovered your website by way of Bing even though buying related issue, your web site got here in place, it seems like terrific. We’ve added to my own favourites|combined with my favorites.